Our friends Brice and Aline stayed with us in August and September with wilderness backpacking and sea kayaking high on the priority list of things to do. 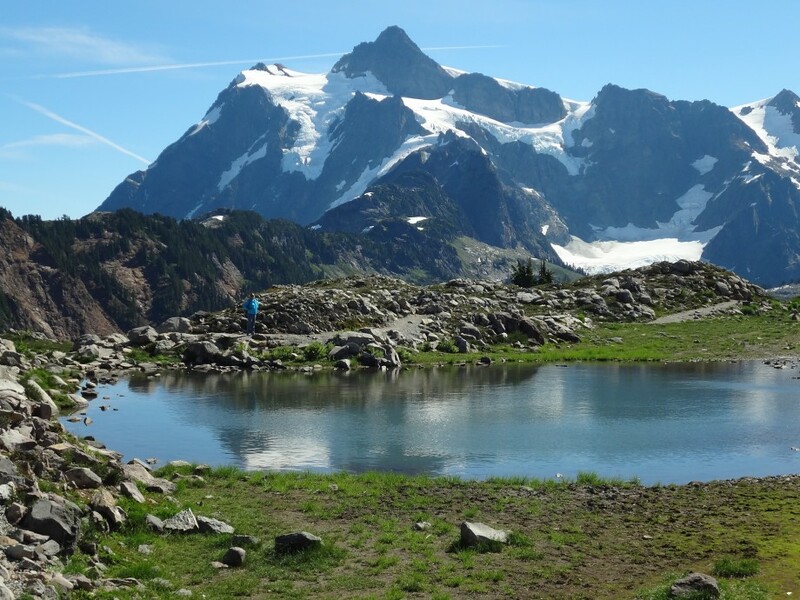 So, we prepared for three backbacking trips and a day of sea kayaking starting with a strenuous trek into the glaciated peaks of the North Cascades (see A Tough Trip Through Paradise in What’s New). After that we backpacked into Mt Baker, at almost 11,000 feet elevation it’s the most heavily glaciated mountain in the United States outside of Alaska. We kayaked into the deep water of Possession Sound off of Whidbey Island north of Seattle seeing sea lions, porpoise and eagles, and finished with a short, but strenuous overnight trip to Rampart Lakes high in the mountains overlooking Snoqualmie Pass, the main highway from the east into Seattle. Mt Baker, halfway between Seattle and the Canadian border, is the white volcano that dominates the horizon as you drive north from Seattle towards Canada – you can’t miss it (unless its cloudy as it is much of the time). It is surrounded by wilderness and national recreation areas and a popular destination among climbers and campers alike. For our trip we chose a fairly easy hike into the alpine parklands of Park Butte and Railroad Grade. We knew that this area could be crowded with people as it is very popular, a primary climbers’ route to the mountains, and relatively easy to reach. But we were going in on a cloudy, misty weekday and so hoped for few people and quiet camping. As it turned out we were right – almost. Starting at the trailhead we immediately crossed a footbridge over Sulfur Creek as a thick mist settled in around us and began an easy walk on the trail through acres of huckleberry bushes full of ripe, blue berries. We didn’t get more than a few hundred yards before stopping to feast on the sweet, juicy berries which were hanging from the bushes by the millions along the trail. But time to get to work and the trail trended upward for the next two miles before reaching a large alpine meadow at the foot of Mt Baker which was close, but not visible in the thick clouds. We found a fine camping spot at the base of Railroad Grade (a trail leading to the glaciers of Mt Baker). After setting up our tents in the cold, blowing mist we decided to hike up to the Park Butte Lookout perched above the boulder strewn meadows of Park Butte just a mile away from our campsite. As we hiked up to Park Butte the wind and clouds settled in even lower – it was cold but beautiful with mist swirling through the trees and over the moorlands of Park Butte, a small family of grouse clucking and strutting along the trail and then off into the heather as we hiked along. After hiking through Park Butte a trail continued up for another ½ mile ending at the Park Butte Lookout, a cabin perched precariously on the knife-edged rocky ridge top with the outside deck protruding over a high cliff. Obviously the views of Mt Baker would be stunning from this vantage point, but visibility on this blustery day was little more than 50 meters. We entered the lookout cabin and relaxed inside for a while, reading through the visitors’ log before leaving, locking the storm doors behind us and leaving the cabin secure as we had found it. As we hiked back down towards our campsite the clouds began to lift and for the first time we could see that we were camped at the very base of Mt Baker which now peeked out from the clouds high above us. 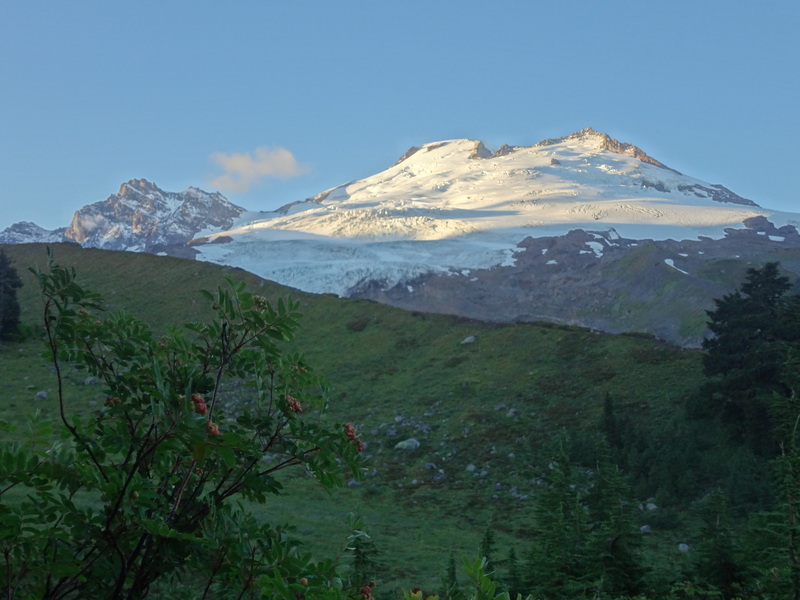 Night time wasn’t far off, so we settled into camp cooking our dinners over our backpacking stoves and as the sun began to set the clouds lifted further and there it stood, Mt Baker, wrapped in white glaciers. Across the meadow from our campsite the sun lit up some clouds still hovering behind a small mountain peak turning the sky orange and red appearing as if a forest fire was raging behind the darkly silhouetted peak. It was a magnificent display and great way to end the day. The next day broke clear and sunny. We had our coffee and oatmeal, packed our day packs, and began the trek up Railroad Grade which started just outside of our campsite. Railroad Grade is a pathway along the crest of a lateral moraine left behind by a glacier that had melted away years ago (moraine – a ridge of rocky debris pushed up by a glacier). As we climbed ever higher towards the glaciers of Mt Baker we began encountering large, fat marmots lounging on the rocks. The further we climbed the more marmots we met until we entered what seemed a small city of them. They seemed as curious about us as we of them and some approached within a few feet of us, chewing on clumps of grass or lying on rocks to take the morning sun. Finally we climbed beyond even the marmots, above the lower parts of Easton Glacier, and finally arrived at a cluster of tents in a rocky basin above timberline – a climber’s camp. Now we were in a world of bare rock surrounded by active glaciers and we could see the climbing teams crossing a snowfield high above us on the upper slopes of the volcano, very small in the distance but clearly visible against the white snow. We took our lunch break and then continued upwards on a rocky ridge that separates Easton Glacier from Deming Glacier. Now with glaciers on either side of us we followed the rocky ridge up to 7,000 feet on slopes of the mountain with close up views of the crevasses, snow bridges and icefalls as we went. We could hear the melt water from the glaciers roaring underneath the ice and an occasional rumble of avalanches somewhere in the massive rivers of ice. We found rocks encrusted with bright yellow sulfur with a faint odor of rotten eggs, a testament to the active status of volcanic Mt Baker. By now it was late afternoon and time to head back to camp. As we descended Railroad Grade we began encountering other parties of hikers coming up. By the time we reached our campsite, the trickle of hikers had turned into a parade and we decided to break camp and hike out – too many people for us. But before we left we picked three or four pounds of huckleberries, an easy task as there were many acres of them throughout the area. When we returned home, Brice would make huckleberry pie that couldn’t be beat but first we stopped at the Tulalip Casino along the interstate highway. Brice had a great idea – the casino has an all-you-can-eat buffet, perfect for hungry backpackers. So changing into a set of clean clothes that we had brought along we appeared presentable (as long as no one came too close to us) and dined on prime rib and shrimp salad as the slot machines whirred and clanged away in the background. Despite the crowds at Mt Baker it was a great trip, but now we had the next day to wash our camping gear and do some shopping before meeting our guide for a half-day sea kayaking tour around Whidbey Island and into the big water of Possession Sound the following day. We were tired but ready for more adventure at the same time. Possession Sound ; it separates Whidbey Island from the Olympic Peninsula to the west. It’s an arm of Puget Sound and the main shipping channel into Seattle. But, it’s also a kayaker’s paradise. We met our guide Travis from the Whidbey Island Kayaking Company at Possession Beach Waterfront Park at the southern tip of the island. After a safety presentation we loaded into our tandem sea kayaks and paddled out into the clear water on a calm, sunny day. The higher peaks of the Cascade Range rose above the forested mainland to the east while the Olympic Mountains filled the western horizon. We had to start early to take advantage of the tides (paddling out in the waning tide, back in on the waxing tide). Tidal currents can be strong around the tip of the island making paddling against the tide much more strenuous and the trip much shorter, so it’s better to paddle with the tide than against it. In our case we paddled about eight miles around the tip of the island to a point of land on the western side, Indian Point and then back to our start at Possession Beach. Along the way we saw lots of marine wildlife; harbor seals popped their heads out of the water to watch us paddle by, a small pod of Dall’s porpoise swam by us their distinctive small dorsal fins rising out of the water, a sea lion surfaced 15 meters from us his body larger than our kayaks, looked at us curiously, and swam away uninterested. We paddled over kelp forests with round pink crabs clinging to the floating fronds, a bald eagle floated by overhead and loons laughed their lilting laugh from further out in the sound. A silver salmon run was occurring around the tip of the island and as we paddled along we saw an occasional salmon jumping out of the water, probably escaping seal attacks from below. After a couple hours of paddling we pulled into shore for a rest at Indian Point on the western shores of Whidbey Island. Walking along the beach we could hear a group of sea lions roaring from their resting spot on a buoy anchored a 1/4 mile out in Possession Sound. We decided to paddle out to them for a closer look, so we pushed off from the beach but as we approached within 15 meters of them a 500 pound sea lion reared up on the buoy and bellowed a fearsome roar at us, its teeth and whiskers gleaming in the morning sun. Sea lions can swim faster than we could paddle and we beat a hasty retreat, not wanting to harass them, but also not wanting to be attacked by them either. We paddled back around the tip of the island riding on the incoming tide, over the kelp forests, past the local harbor seals, and back to Possession Beach. We pulled the kayaks out of the water, thanked Travis for an excellent trip, and drove back to the ferry landing at the small town of Clinton on the southeastern side of Whidbey Island. The ferry from Clinton lands at Mukilteo on the mainland which is just a mile from our house and as we landed we noticed that the Mukilteo Lighthouse Fair was on. So, tired as we were, we walked around the fair for an hour before returning home to rest up for the next trip on the following day, . . . a steep climb into Rampart Lakes in the highlands of the central Cascade Mountains. Rampart Lakes are a group of small lakes filling a glacially scoured rock basin above the much more well-known Rachel Lake. In fact, the trail to Rampart Lakes first goes to Rachel Lake, then up a steep but mercifully short climb to Rampart Ridge, and followed by a mile walk along the ridge to the group of lakes below sheer granite cliffs. However, the trail up to Rachel Lake isn’t so merciful. Only a few miles off of Interstate 90, the main eastern entrance into Seattle, Rachel Lake is a popular hike. The first two miles are a gentile walk through woodlands along a sparkling mountain stream. Just over a mile from the start is a beautiful cascade over polished rock, a great lunch spot and day hike. In another mile the trail changes character dramatically as you begin climbing 1,300 feet in little over a mile to Rachel Lake, the pathway straight up with rarely a switchback to break the steep ascent. The climb ends abruptly at Rachel Lake, a sparkling jewel beneath rocky Rampart Ridge. But Rampart Lakes are a mile and a half further on, so we soldiered on up another 600 feet or so on a steep, unmaintained trail to the flatlands and huckleberry fields on top of Rampart Ridge. Pikas chirped at us as we climbed the rock falls to the ridge top (pikas – rock rabbits – small rodent-like animals living in rocky, alpine areas). Once on the ridge it was an easy mile walk through forest and berry fields to Rampart Lakes. The lakes are a collection of ponds and small lakes set in a rocky basin below another high rocky ridge. The well-worn trails around the lakes attest to the heavy use the area gets, but it was cloudy and cold and a week day – there was nobody else there, and we soon found an ideal campsite around a small group of wind-tortured fir trees on the shore of the southernmost lake. We set up our tents as the clouds lowered in around us, a heavy cold mist settling in, and the wind picked up lowering the air temperatures into the 40s Fahrenheit. After exploring around the lakes we took refuge from the wind and cold in the group of trees at our camp, cooking hot soup and sipping whiskey to ward off the cold. Finally the cold wind took its toll on us and we retreated into our tents at sunset to warm up in our sleeping bags. We didn’t come out until the next morning which arrived with less wind, but more mist and still cold. Although cold and windy, the views around the lakes were still great; clouds alternately lifting to reveal the square summit of Hi-Box Mountain then lowering again to hide the peaks around us while ravens croaked in the misty woodlands and a water ouzel bobbed along in a lake nearby. We had planned to day hike up to Alta Mountain just a couple miles away, and then hike out, but the clouds were persistent and there would be no views across the mountains from Alta today. Also, Brice and Aline had to prepare for their flight home the day after we returned from this trip. So, satisfied with the quiet stay we had enjoyed at Rampart Lakes, we decided to hike back out. We hiked out in little over half the time it took to climb up to the lakes, drove to the small town of North Bend, and had our burgers at Twede’s Café known as the local café from the Twin Peaks television series. We visited nearby Snoqualmie Falls where the Snoqualmie River plunges dramatically over a high cliff before driving home. Between the backpacking trips, sea kayaking, local hikes around Mukilteo and visits to Seattle we were all pretty tired by now. But we all had a great time and as we drove Brice and Aline to the airport we were already making plans for next year; maybe a summit climb of Mt Baker, a multi-day sea kayaking/camping trip around the San Juan Islands, an off-trail backpack trek into the wilderness around Mt Rainier. It’s almost as fun planning these trips as doing them and I noticed that the more trips we take, the longer and more adventurous they become.